General Hospital (GH) spoilers tease that Ryan Paevey is leaving the ABC soap and that means fans will have to say farewell to Nathan. Of course, Maxie (Kristen Storms) will have to do the same. Since Nathan’s exit involves a presumed death, you can bet that Maxie will be torn apart. Naturally, Kirsten Storms will also hate to see her TV hubby go. She seems to be close friends with her onscreen spouse, so saying goodbye should be tough. It looks like Paevey gave Storms a parting gift to commemorate the time they spent working together. 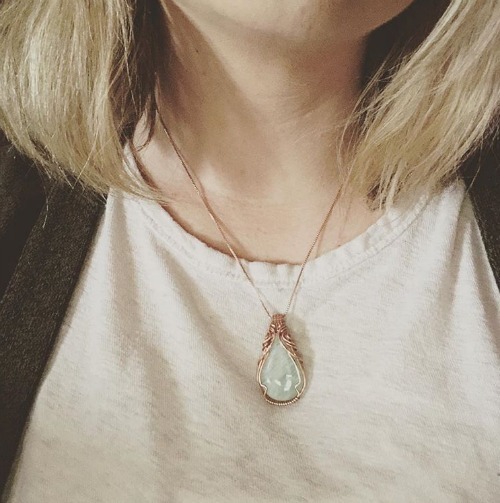 In a recent Instagram post, Storms showed off a necklace that Paevey gave her. In fact, he didn’t just give her this present. Paevey actually made it! Jewelry-making is one of his passions, so he was happy to give Storms a piece from his collection. Storms wore the stunning necklace in the photo and added a caption about how much she loved it. She said she was “stoked” about Paevey’s gift. It certainly looks great on her. Paevey was sweet to think of Storms on his way out at General Hospital. His soap wife will undoubtedly miss him. The same goes for the rest of the cast and crew. This is definitely a difficult loss for GH. Nevertheless, the show must go on. Nathan’s departure will be devastating, but some awesome drama is sure to come from this. General Hospital spoilers say Port Charles will grieve after Nathan is believed to be dead. Viewers can expect many mourners once this shocker strikes. Maxie, Lulu (Emme Rylan), Dante (Dominic Zamprogna), Dr. Obrecht (Kathleen Gati) and Amy (Risa Dorken) will be among the crushed. There are going to be tears falling all over the place, but everyone will have to find a way to get through this. Luckily, this is a soap and returns from the dead are common. General Hospital will likely make it easy for Paevey to come back. Going with a presumed death eliminates the need for too many wild explanations. If Paevey moves on for good, perhaps GH can find a suitable replacement. Recasts are an accepted part of daytime dramas, so a new Nathan might come along eventually. Regardless, it’s hard to say goodbye to this one! Are you dreading Ryan Paevey’s departure as Nathan? What do you think of his gorgeous present for Kirsten Storms? We’ll give you updates as other GH news comes in. Stay tuned to the ABC soap and don’t forget to check CDL often for the latest General Hospital spoilers, updates and news. Stoked on my necklace made by @ryanpaevey.